During the Qin Dynasty, Emperor Qinshihuang began building the Great Wall to keep northern nomads out of China. In the Internet age, China has invented the Great Firewall to block free thinking, to censor messages and images which criticize government policies and draw attention to violations of human rights, and to keep this activity from circulating in the blogosphere. While the ancient Great Wall of China is regarded as a wonder of human civilizations, the Great Firewall in cyberspace becomes the most sophisticated, extensive and notorious project preventing the world’s largest population from expressing themselves with contemporary technologies. How does this invisible wall impact the lives of people within China and beyond in the information era? The Great Firewall of China is an augmented reality public art project and performance. Built for smart phone mobile devices, the project seeks to make Internet repression visible by setting the Great Wall ablaze virtually. The public can simply download and launch the project and aim their device’s cameras at the at Wall. 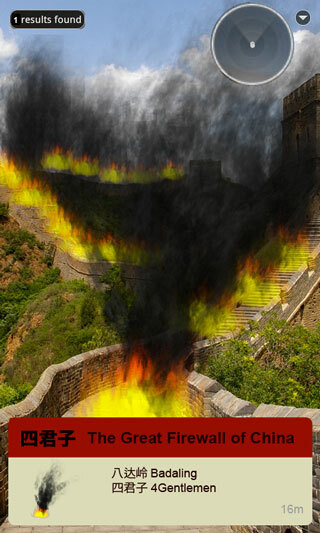 The application uses geolocation software to superimpose flames at precise GPS coordinates along the Great Wall, enabling public to see the fire integrated into the physical location as if it existed in the real world. Manifest.AR at the ICA, Boston, John Pyper, Daily Serving, March 31, 2011. Tiananmen Square Augmented Reality, Jo-Anne Green, Networked Performance, Feb 26, 2011.